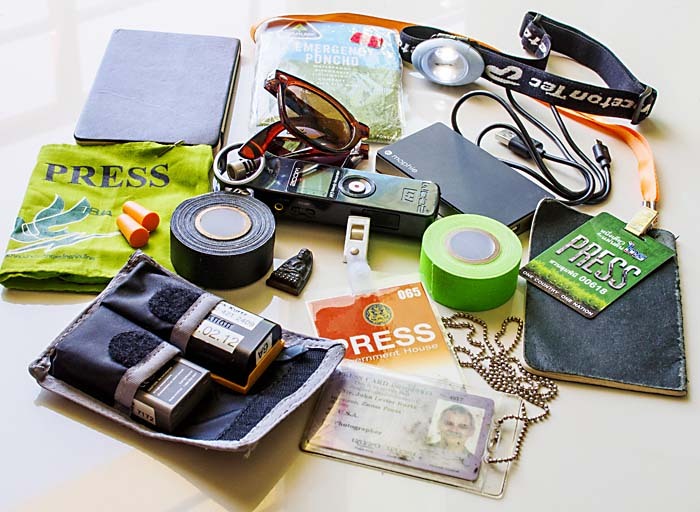 The other stuff I carry in my camera bag: credentials, sunglasses, gaffer tape and more. Most photographers I know carry a lot more than just cameras in our camera bags. In fact our camera bags are really pretty close to being the man-purse pioneered by television comedian Jerry Seinfeld. Here's what I carry in my man-purse. Press credentials: I always have a couple of sets of press credentials with me. I also have my green arm band from the Thai Broadcast Journalist Association stuffed into the bag. I put them on when I'm working in a protest area or around a breaking news scene. Notebooks: Plural. I have a couple of Moleskine notebooks in my bag. One is for note taking when I'm on stories, the other is for taking notes not related to stories (shopping lists, phone numbers, email addresses etc). My background as a journalist is showing here. I never leave home without a notebook and a couple of pens. But hey, I don't use pocket protectors. Spare batteries: Okay so this is directly related to the cameras but in a day when every camera is battery dependent it's worth pointing out. I always have a spare battery for my Canon cameras and at least one spare battery for my Micro 4:3 cameras. Battery life in the Canons is terrific. Nearly 1000 frames per battery and I seldom actually have to use the spare Canon battery. Battery life in the M4:3 is pretty bad. Under 300 frames per battery. I frequently end up using the battery in the camera and the spare. If I'm going out for a long day of photography I carry three spares for the Micro 4:3 camera. Ear plugs: When I was working for newspapers I frequently had assignments in noisy industrial areas or noisy night clubs. Now I frequently find myself in noisy whistle blowing crowds. I have ear plugs in almost every camera bag, camera belt pack or computer bag I own. I use them all the time. Gaffer Tape: Like it's more famous cousin Duct Tape only better. Gaffer tape has thousands of uses. Covering a media event where everyone has a spot on a riser? Mark your little piece of heaven (AKA shooting position) with gaffer tape. Need to tape a scrim to a window to block an obnoxious highlight? Gaffer tape doesn't leave sticky residue. Riding in a small boat on the open ocean and your fuel line springs a leak? Fix it with gaffer tape. (That happened to me in Florida a long time ago. Line sprung a leak, patched with the gaffer tape on my bag.) Your light leaky Holga has one light leak to many? Gaffer tape will fix that. And if you're wondering a gaffer is the head electrician on a film set. iPhone Battery: I love my iPhone but like my cameras it's only as good as the battery and when I'm working my iPhone battery is quickly depleted. I have a battery pack on the iPhone, which dramatically extends my run time but I also carry Mophie Powerstation. It's an external battery pack that can recharge phones (any phone with the right adaptor), tablets and USB devices. Sound recorder: We live in a multimedia world and that means recording sound. I use a Zoom H1 recorder. It's tiny, reliable and has decent quality. It's not perfect though. Battery life is not very good and it can be a little fidgety to set up. Headlamp or flashlight: For obvious reasons. Sometimes we find ourselves in the dark. A headlamp is nice because it leaves your hands free. A flashlight is slightly smaller but less convenient. I got mine at REI in the US for about $20. Sunglasses: Because my future's so bright I gotta wear shades. Poncho: It can rain at anytime and I find umbrellas too bulky. I have a bunch of cheap (less than $1) ponchos which are essentially disposable. I get caught in a rainstorm, I bust out the poncho. I throw it away when it quits raining or when I get home. Amulet: A Bangkok motorcycle taxi driver gave me an amulet when I was covering the Thai army crackdown against Red Shirt protestors in 2010. I've carried one since then. That's what I almost always have in my bag that's not directly camera related (except for the batteries). What doodads do you carry to complete the kit? Please keep comments civil. I moderate all comments and will not post or respond to comments that are racist, name calling or hateful. Anonymous comments are not allowed. Thank you.